The Real Madrid star collects the inaugural The Best FIFA Men’s Player Award, after conquering the biggest trophies in football last year. Ronaldo received 34.54% of the votes on the way to claim The Best FIFA Men’s Player Award, which saw him beat the likes of second-placed Lionel Messi and third-placed Antoine Griezmann, who carried 26.42% and 7.53% votes respectively. The 31-year-old helped Real Madrid lift their 11th Champions League trophy last season, while also proving instrumental in Portugal’s victorious campaign at the Euros in France. The Best FIFA Men’s Player Award is Ronaldo’s second personal accolade that recognizes his achievements for 2016, with the first one being the prestigious Ballon d’Or which he won in December. FIFA and France Football – the magazine that awarded the Ballon d’Or (1956-2009) – unified the award between 2010 and 2015 that was dubbed the ‘FIFA Ballon d’Or,’ which saw Ronaldo scoop the prestigious accolade on two occasions, while his counterpart Messi took the award home a staggering four times. 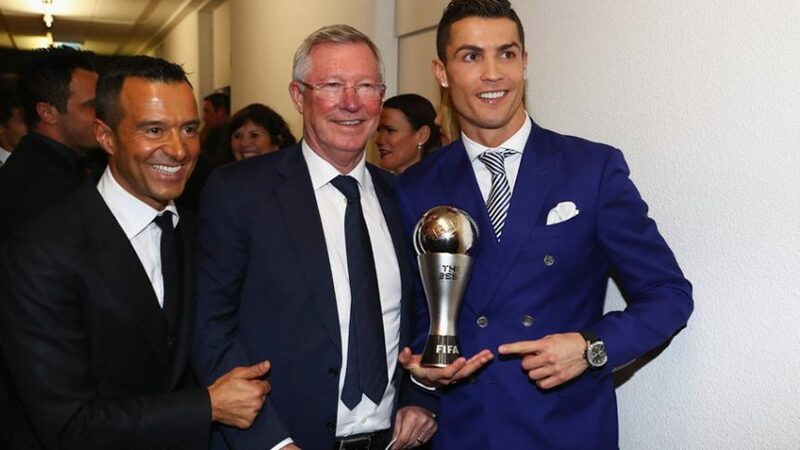 Despite enjoying a fruitful relationship, football’s governing authority and the French magazine decided to part ways recently, thus allowing the Portuguese captain to receive two separate awards for his remarkable achievements in 2016. However, since the start of the new campaign, Ronaldo seems to have hit a slump in form that has seen him appear in 12 games out of 16 in La Liga, which resulted in 11 goals (as of January 10, 2017). During the victorious season last year in Europe’s elite competition, he bagged an impressive 16 goals in 12 games, while this campaign so far he’s only managed 2 strikes in 6 group stage games. Overall, this brings Ronaldo’s goal tally – until this stage in the season – to merely 17 in 20 outings, which is far below the goal number he normally enjoys during this period in the campaign. The Best FIFA Men’s Player Award is well deserved, considering his all-conquering year. Ignoring his first season with Real Madrid (2009-10), when he bagged ‘only’ 33 goals in 35 games across all competitions, every season since then has seen the Madeira-native score more than 50 goals. Although Ronaldo has a knack for hat-tricks and more in any given match, it’s hard to predict whether he will be able to maintain his sky-high standards this season, considering he needs to score another 33 goals in the remainder of the 2016/17 season to once again hit the 50-goal mark. Now, don’t get me wrong. Having 17 goals to your name only midway through the campaign would be a significant feat for any professional football player, but this is Ronaldo we’re taking about, so expectations are obviously quite different. Both him and his main rival Messi are in a different sphere when it comes to goalscoring efforts; the Argentine suffered the same scrutiny when he scored ‘merely’ 41 goals overall in both the 2013/14 and 2015/16 seasons. The Portuguese will turn 32 years of age on February 5th this year, which is staggering to be scoring that many goals from his position at that age, but it also helps put things a little more into perspective. A decline in fortunes is inevitable, as you can’t fight biology, no matter how good you are. Ronaldo will probably continue to hit some high numbers in front of goal in the coming seasons, but the question is for how long will that last before age starts to affect him? Has Ronaldo reached the very pinnacle in 2016? Will The Best FIFA Men’s Player Award be his final personal accolade? Back Real Madrid with Intertops Sports! Real Madrid sit atop of La Liga with 40 points and a game in hand, while their arch-rivals Barcelona find themselves in third with five points behind. From 16 games in the Spanish top flight, Los Blancos are undefeated, having won 12 games and only drawn on 4 occasions. It’s no surprise Zinedine Zidane’s men are the favourites for the title with odds of (1/3) 1.33, while the Catalans – who won the previous two editions of La Liga – are underdogs 9/4 (3.25), with Atletico Madrid being heavy outsiders 40/1 (41.00).